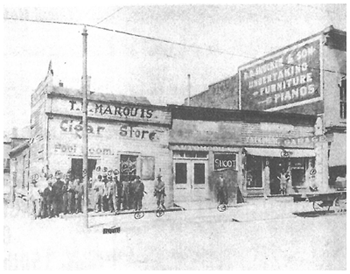 Prior to the erection of the Canby Building in 1912 on the corner of Main and Chillicothe Avenue, there was a wooden structure that housed a cigar store and garage and shooting gallery on what was commonly known as “Boyd Corner”. The original owner of the Boyd corner was John Tullis, who received the patent for the land from the United States. The town of Bellefontaine was laid out in 1820 and Mr. Tullis was the owner of the property at that time, and after many transfers over the years, in 1855, the property was obtained by Robert and William Boyd, and the latter sold his interest to Robert Boyd April 12, 1864. The property remained in possession of Robert Boyd and his heirs until a few weeks ago when it was purchased by R. F. Tremain, of Bellefontaine, and his brother in law, Edward Canby of Dayton, who developed the property with the construction with the handsome brick structure known as the Canby Building. Edward Canby was the son of Bellefontaine who has prospered greatly in Dayton but never lost interest in Bellefontaine and it’s progress, and his brother-in-law, Mr. Treamin, was deeply interested in the location of the property partly by reason of the fact that he owned the two-story brick building on Main Street which adjoins, the building occupied by the D. D. Smucker & Son furniture and undertaking establishment. The Canby Building had a frontage of 55 feet and a depth of 130 feet on the Chillicothe Avenue side. It was the vision of the developers to be a modern and high-class structure, equipped for business purposes. The architect in charge of the construction stated that given the building’s size, it would be the handsomest between Cincinnati and Cleveland. The first definite announcement as to the occupants of the Canby Building came in 1913 during development when Morris and Palmer, the enterprising dry goods merchants located on South Main Street, stated that as soon as the new structure was completed they would occupy the entire first floor together with the basement and would move their store to the new quarters adding numerous lines not at that time carried. The building was admirably adapted to the needs of Morris & Palmer, the entire first floor to be thrown into one room with a balcony in the rear. The commodious basement is to be finished in keeping with the first floor and will be utilized for selling purposes; and the second floor was at one time occupied by the office of Buckeye Cement Company, Marl City, near Rushylvania, where the material for Bellefontaine’s pioneer concrete street came from. The third floor was occupied by the Big Four Railroad and housed telegrapher’s equipment at one time. Eventually the second and third floors housed the main office for the entire Ohio Division superintendent. 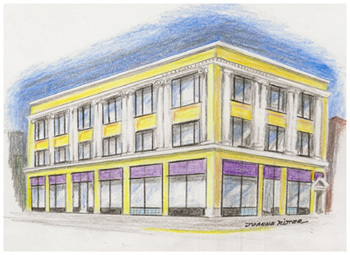 Over the years, the Canby Building has housed several residents including (but not limited to) law offices, professional services, and retailers including the late Dee’s Department Store. 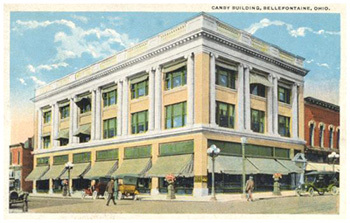 Eventually the building became vacant and the Downtown Bellefontaine Partnership, Inc. took over ownership and began the journey of revitalization, including specific efforts to mitigate the risk and exposure of falling brick from the peak of the southwest corner of the building; as well as investing in a new roof. In May 2012, Jason Duff, local real estate developer, purchased the property and began revitalizing and developing the property. Immediate improvements took place as new commercial windows and storefront glass was installed. Contracting with local mason Doug Fleschman of West Liberty, Ohio, to re-tuck point and polish each terracotta brick and column on the exterior of the building. The masonry team has also rebuilt the faulty southwest corner parapet wall that for many years was the concern of decay and crumbling brick and is addressing any other issues they encounter throughout the 18-month revitalization project. As the energy in downtown Bellefontaine continues to surge, other local developers and entrepreneurs are taking interest in investing in downtown, recruiting businesses and creating opportunities that bring in out-of-town customers and locals alike. From the beginning of construction of the building in 1912, the vision for The Canby Building was to be a beacon in the community for hope and prosperity. The property is poised to provide an excellent first floor with over 10,000 square feet for a restaurant or retail operation, including an elegant mezzanine balcony and stairwell leading to it. The second and third floor await development to bring back professional offices. With over 35,000 total square feet, The Canby Building offers much more than available development space for the right business, it’s Bellefontaine’s shining light for continued growth, expansion, and success.